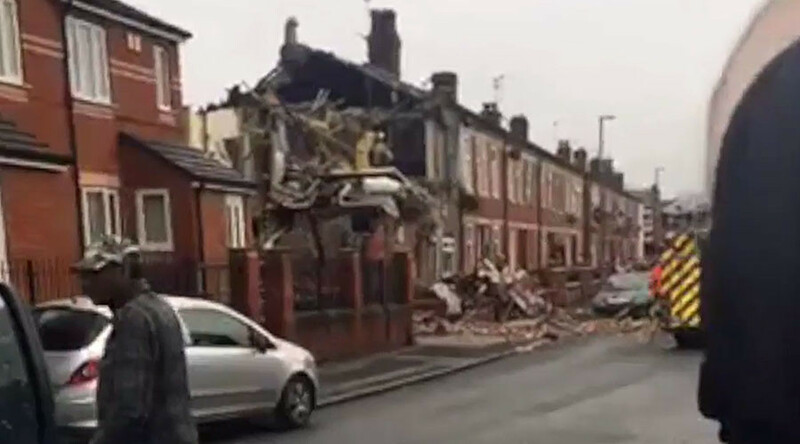 A house in Manchester has been almost entirely destroyed by an explosion, reportedly leaving five people injured. The home in Blackley can be seen roofless and reduced to crumbling brickwork in videos and pictures on social media. Emergency services were first called to the scene at 12:30 and five people are reported to have been injured though it is unclear how badly. In a statement on their website, Manchester fire service said: "At 12:40PM on Monday, January 16, five crews from Blackley, Ashton, Central First, Broughton and Chadderton were called to a partially collapsed end terrace in Victoria Avenue, Blackley. "Crews are assessing the scene and carrying out a primary search of the area. One casualty is being treated by the road. "An aerial unit from Stretford is on route, along with two TIUs from Ashton and Leigh, a command unit from Rochdale, a timber unit from Rochdale and a fire dog." There are unconfirmed reports that the incident was a gas explosion.